Click on this hyperlink to see a technical data table of Ceramic Properties. Click on this hyperlink to see a Thermal Expansions Chart of metals and ceramics. NOTE: The above documents are in Adobe's Acrobat portable document format (*.pdf). To view or print these documents you will need version 4.0 of Adobe's Acrobat Reader or higher. 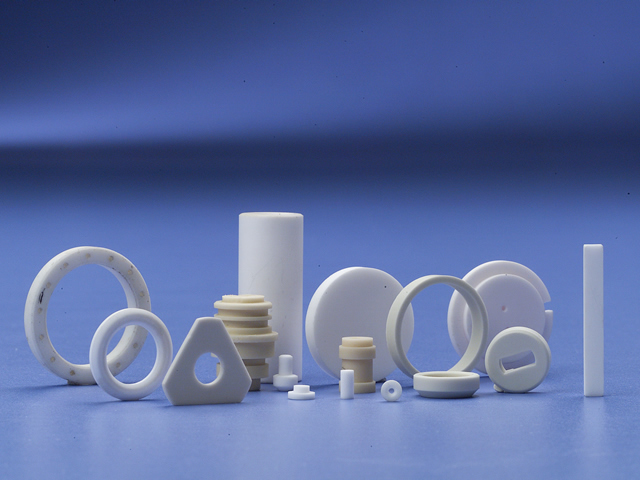 MPD forsterite ceramics are dense, fine grained, vacuum-tight materials originally developed for use in hermetically-sealed devices such as VED's (electron tubes), rectifiers, and vacuum switches. Their unique combination of properties , however, has led to broadly-increased usage. MPD forsterites combine high mechanical strength, low dielectric constant, and resistance to corrosion, with a unique expansion characteristic ideally suited to ceramic-to-metal sealing techniques. For example, the thermal expansion characteristic of one of the patented forsterite composition matches that of titanium metal over a broad range of temperatures, permitting the manufacture of many devices for critical high tech applications (See Thermal Expansions Chart). MPD alumina ceramics meet the life, reliability and severe-environment factors imposed in high tech and space bound applications in virtually every respect: exceptional hardness, flexural strength, and electrical properties combined with an excellent resistance to highly corrosive agents. Available in a wide range of grades from "general purpose" to virtually pure sintered forms approaching theoretical density. MPD alumina characteristics are matched in the required combinations to the needs of each application. The "general purpose" materials range in composition from 94% to 97%, and have a precise balance of additive oxides to control such critical properties as flexural strength, density, dielectric power factor and metallizeability. Other grades are tailored to have extremely fine grain size and low pore volume where surface finish is important. Still other compositions exceeding 99% alumina are designed to have ultra-low dielectric loss for critical electronic applications, or inertness to the severely corrosive alkali metals. All of these materials can be joined to metals and non-metals through appropriate sealing techniques employed in-house. MPD manufactures aluminas which are metallized and plated to your specifications - a factor of considerable importance to applications demanding one of the high-purity aluminas which require special metallizing treatments.